King Baudouin I (reign: 1951 – 31 July 1993). 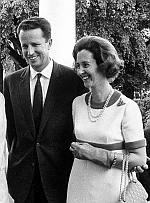 and Queen Fabiola of Belgium during a visit to President Nixon in Washington, May 20, 1969. 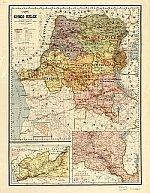 In 1958, South Carolinian Amanda Brown travels to the Belgian Congo to oversee a missionary guest house the town of Belle Vue. Against the backdrop of the mounting forces for independence and the mining company's race to take as many profits as possible in the meantime, the relationship of the local witch doctor, Their Death, and his two wives takes the reader into a more interpersonal struggle, within the family and with other tribes. 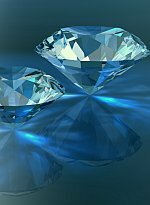 The discovery of a huge diamond leads to a path which will draw together various residents in a web of deals that sets one against another and draws together others once at odds. Greed from several sides, corporate and individual, sets off a dangerous confluence of events and interactions that might lead to murder itself. As the movement for independence heats up, Amanda and the witch doctor's family will be tested in ways they never would have imagined possible. In THE WITCH DOCTOR'S WIFE, Tamar Myers, an author born and raised in the Belgian Congo, takes the reader straight into the heart of that country through the art of storytelling. Her characters and their interrelationships drive the story forward, drawing together various stands of seemingly unconnected story lines, at least at first, from the mysterious Nigerian's plight to a local store owner. THE WITCH DOCTOR'S WIFE gives a fascinating look into this moment in time and this culture. Characters native to the area provide amusing and insightful perspectives on the strangeness of the western culture. The oddness and humor reaches Western readers in a manner that allows a look at oneself in a new way, challenging things taken as normal as perhaps not so normal. Instead of pitting one culture against another, Tamar Myers has a more generous vision that recognizes the differences of cultures with humor and humanity. She develops her characters and their relationships, drawing the reader into the layers of the community to the depth and undercurrents in their interactions. As the story develops, this reader found herself pulled back to the community, and anxiously awaiting the moment to pick up the book again to return to the richness of the fictional world. The growth of the main characters throughout the story gives a depth to the story that leaves one feeling the transformation within the human heart, the timeless motivations that haunt humanity, and the twist of circumstance or miracle. Tamar Myers interweaves the mystery itself so intimately within the world she creates that the mystery of the diamond develops naturally rather than the typical mystery scenario of a murder with a trail through several red herrings to be discounted before the final mystery is solved. For this reason THE WITCH DOCTOR'S WIFE will appeal to both fiction and mystery lovers. I love it all the more for its richness in storytelling and the lush, poetic tenor of the language! The unfolding of the mystery itself impresses all the more because it develops from the story itself, from the historical landscape and intersecting relationships and motivations of the characters inhabiting that landscape. As the novel progresses, several unexpected twists and turns lead to shocking acts, and yet acts that emanate from the growth of her characters. The surprise ending leaves one breathless, reading it again and again to feel its full impact. What a wonderful unexpected twist! How well Tamar Myers leaves the reader with the final look at the mesmerizing story! Quite simply, THE WITCH DOCTOR'S WIFE is for readers who want a little more from their mysteries or a little more from their fiction. This reader would include THE WITCH DOCTOR'S WIFE as one of the best novels in many years, one of those truly "wow" books. If you love the combination of mystery, literary fiction, and a look at a different culture and time period, THE WITCH DOCTOR'S WIFE is a must read. A beautiful story with a delightful mystical mysterious touch, THE WITCH DOCTOR'S WIFE is so much more than a mystery.